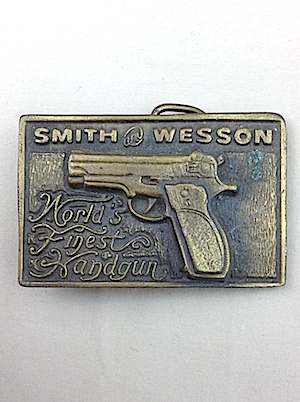 Vintage Belt Buckle, "Smith and Wesson", "Worlds Finest Handgun"
Home > Men's Accessories > Vintage Belts / Buckles > Vintage Belt Buckle, "Smith and Wesson", "Worlds Finest Handgun"
Groovy Vintage Belt Buckle! A classic looking handgun is carved across the middle with the brand "SMITH and WESSON" written above and "Worlds Finest Handgun" in a fancy typeface below the trigger. 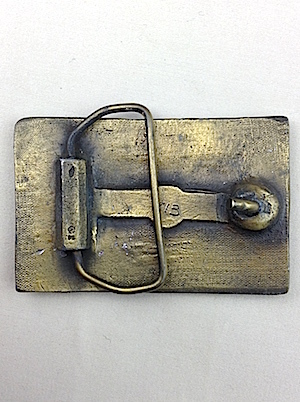 Nice, brassy finish. Numbers on the back say 713.